Varsity Pools & PatiosNewsSwimming Pool Builder San AntonioWhere Should You Put Your Fire Pit? Where Should You Put Your Fire Pit? 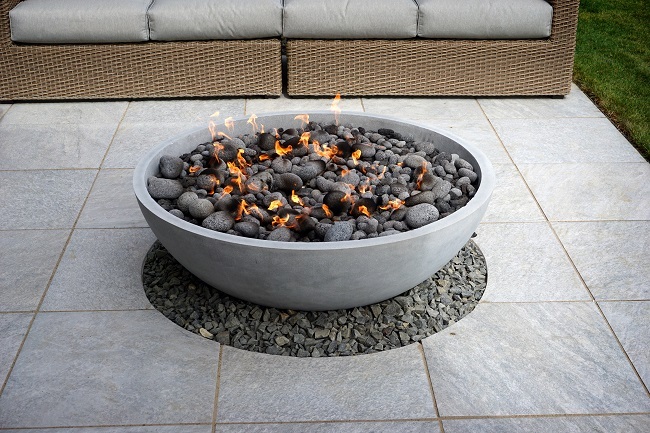 A decorative fire pit or fire table is beautiful. One way to incorporate it is as a feature between one wall of your swimming pool and the surrounding deck. Segmenting your backyard can keep things organized, and it’s a beautiful design element. But if you want the fire to provide heat, you need to make it accessible. Either put it in a large empty space where seats can be arranged around it, or put it near your tables and counters where people already make themselves comfortable. If you want your fire pit to add lighting after sunset, that’s another factor to keep in mind. Are you in a windy area? Fire pits and tables are designed to be safe in all backyards. But some backyards are windier and closer to nature than others. If you live near a green area or you have a wrought iron fence, the wind can pick up flames and potentially start a fire. Look for models that you can remotely control and shut off. Many fire pits are also built with glass sides so you can enjoy the fire without caring about the breeze. Do you want a permanent fixture? If you want your fire pit to flow seamlessly into your backyard design, go to Varsity Pools. Whether you’re constructing your outdoor living space from scratch or you’re adding new features, our designers can make your fire features fit in perfectly.